AM- 7.65 Easy, last 1.5 pacing my 10 year old- 10:25 pace. Pretty good for a kid just starting out this past month. PM- 88= warm 11.05 miles, relaxed pace. Work is just tiring these days, waiting to catch up and get this back to normal. I did scare some people running as it got dark and did my good deed in the neighborhood as a girl was chasing her dog with a leash so I sprinted and grabbed the leash for her, she thanked me (I was hoping for water, but alas no luck there). PM- 13, started slow, then after 7 ran progressively faster. Last mile 7:22. Overall better day of work, trying to manage the time properly so the stress does not affect the running. Read an article about another high school kid dying during football conditioning in the heat/humidity. They push and are afraid to tell the coaches they are spent. If I was a coach and was seeing this happen I would figure out a way to practice in cooler temps or indoor or something- because something like this should never happen. Easy run, not sure if I will get out tonight or not. Thinking of letting the legs rest and use this week to spring into heavy miles next week. I won't be breaking down this race report like normal- again more later. I was hoping on a normal course I could hit sub 41 - not easy, but not killing myself. I thought on this course I could hit 41 and a half or maybe if I killed it sub 41. I didn't. I really did not like my time, but tough to judge with the added hill. I did improve my time and when I looked several people were worse than last year. I went from 5th to 2nd, but somehow that still was lacking. The race was set up without an award part, you got your metal as you finished if you were in top 3 of your age category. That way you can leave when you are ready and I like that. After I left I found out that one of the runners collapsed after they finished. They needed CPR and were rushed to the hospital. I am still waiting to hear if they made it or not. It really made me wonder since I just posted a few days ago about the high school kids who died in the heat during football conditioning. They had water stops. 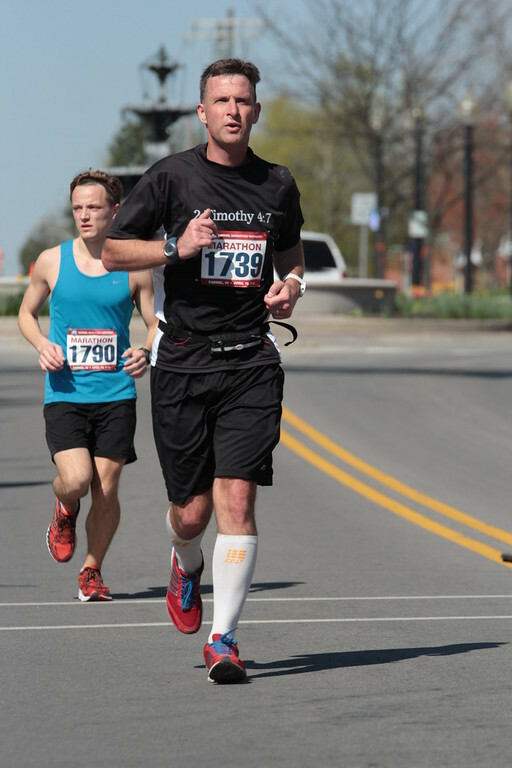 I see plenty of people who run 5k's who maybe are not at all ready, but most people who take on a 10k are better prepared, or maybe I am missing the point. Were the conditions that bad? I think it was all very sad and maybe it affected me more than I realized- not from a mortality standpoint. I am more than secure there thanks to God. Hopefully they are alight and hope this did not bring anyone down (probably a good day for one to skip my blog). PM- New shoes arrived, love the orange color :) It is going to a long work week until Friday :/ 7 more easy paced miles. PM- another 7, relaxed but a bit quicker. Work is kicking my tail. Sleep. Need sleep. Very early day tomorrow. Way to long at work today... bummer. Only could sneak in this short quick run. Only could get this in the middle of the afternoon- HOT. :/ Ugh. Tomorrow things should get back to normal with work and I can catch up with blogs. Tough work week, glad it's almost done- it set me back some miles at a bad time, but I will just have to work harder. PM- 7 Easy, moderate pace, no watch. Calmer day of work! 3 Miles Warm up, 7 Miles tempo (mostly sub MGP) 7:31, 7:22, 7:08, 7:11, 7:09, 7:10, 7:16 - 2 Miles recovery, then 11x500m Intervals with 1 Minute recoveries (yes, odd number and odd distance, was aiming for 2 min at a time) Pace- 7:02 - legs wouldn't move!, 6:42, 6:34, 6:52, 7:17 (steep incline), 6:47, 7:02 (hills), 6:59 (getting tired). Not quite as quick as I would have wanted - I was looking to be in the 6:30-40 area, but I will take it today. 2+ Miles cool down, was going to make it 20 today, but paced my 10 year old instead (the better choice) - we got slushies after, she loved that. Some of you are racing today! Hoping for the best! AM- A very nice 57/92% - loving that. Basic recovery run. PM- 7 more, some along the bike bath. I do believe it is getting dark sooner. Good day. AM- 59/90% - Temps felt great, legs felt tired - 7 easy. Long day, tried to start work early to free up my evening, but we had a plumbing snafu in the main bathroom today. I could not fix it, had to turn the water off coming into the house and needed a plumber.... took several hours and several hundred dollars. Oh well, I am thankful that we had the money to get it fixed- hopefully it won't put a snafu into vacation in a few weeks. PM- long day, 4 Easy. AM- 72/67% - odd for here, temps went up 13 degrees, but humidity has not been that low in the morning since May. Decent to run in :) Things started off well enough but upset stomach kept my- on my toes?- for the first bit. It eventually settled down after 7 miles, at least enough to run some intervals. 10 Miles warm up (ahem, base run, what is that these days? I seem to vary from 8 to 9:30 lol), then 6x800 with 400 recoveries. 3:19, 3:17, 3:18 (hills), 3:18 (hills), 3:17, 3:16 + cool down. AM- 71/87% Man we had some serious thunderstorms last night, 4 different waves, made for a scared 10 year old. Dead legs, 7 recovery. PM- 85- 7 more easy. AM- 68/92% 7 easy, knew I had a full day of work ahead of me so I was out early. Work was long, but got enough done. PM- Stopped at a bike path (loop) on the way home from work. 5.1 easy. AM 61/92% (73/73%at finish)- so overall no complaints on the weather. I felt like it was a good week of miles and even though my legs are somewhat tired I wanted to finish the week strong in hopes I could slowly back off and then taper. 3 weeks to WPAFB Marathon so these are the final training runs that will pay any dividends. I figured if I could have a good 15 between a warm up and cool down and I should be satisfied. 2 Miles Warm Up (9:24, 9:01), then miles 3-17.5 (7:57, 7:48, 7:44, 7:33, 7:37, 7:32, 7:28, 7:36, 7:37, 7:25, 7:25, 7:22, 7:23, 7:18, 7:05 - pace for the 1/2) then 2.5 Cool down (it was going to be 3 cool down, but I felt pretty good and thought I would just run another half at a good pace). Afterwards I wondered if I should have went ahead and pushed trough the last 2.5 hard. I had the lungs for it, my legs were just tired so it was by design. Sometimes I can't help but question the 'if's'. 7:32 Avg (minus the warm up). AM- 62/98% Felt good- 7 Recovery, but the legs were not as dead as I expected, which was nice. PM- 6 more, had some bikers with me this time. Easy, but again, the legs had more pep than I expected- although the left quad/groin area is sore. AM- a nice crisp 55 degrees. 6 easy, would have done more but carried away chatting. AM 64/92% - I wanted to get some intervals in today. I had a sensitive stomach and it played a part in turning this into an interval/tempo type run. Between tired legs and feeling ick my 'speed' work was less than stellar. Ack.